Yasir Qadhi, billed by the New York Times as "one of the most influential conservative clerics in American Islam," recently told one of the nation's largest Islamic conferences that the Quran "destroys" American capitalism. "Who amongst us would have predicted five years ago that this nation would despise and hate the very [economic] system that they used to claim was the reason for their success?" he asked hundreds at a session of the Islamic Circle of North America (ICNA)'s national conference in late May. "Now the system has been destroyed and demolished. Now 99 percent of America is saying Occupy Wall Street." "This is a Pharonic society that we enjoy the pyramids, but you cannot enjoy pyramids without millions of slaves. And this is what this society has become," Qadhi said, repeating a classic Muslim metaphor for a society filled with corruption. Although his speech was intended to introduce a Somali charity worker, Qadhi used his time to call for converting America and radically altering its culture. Qadhi's invitation to speak at the ICNA conference is puzzling, given the group's campaign to cast itself as a moderate religious group whose values are fully compatible with life in America, and given Qadhi's record of espousing a diametrically opposed viewpoint. The convention's theme, "Defending Religious Freedom, Understanding Shariah," mirrors a national public relations campaign ICNA is waging. Qadhi didn't limit his comments to attacking America's economic system. He argued that had the Muslims engaged OWS protesters, they might have taken control of the movement and made huge gains in converts. "Brothers and sisters, where were we at the height of the Occupy Wall Street movement to simply tell them, 'Oh fellow Americans, our lord has told us in the Quran that this system is not a good system, that this system will collapse?" he said. "This Ayah [Quranic verse] is the strongest Ayah criticizing the capitalist system as it exists in America. In five words, Allah demolishes this version of capitalism." His calls were greeted with shouts of "Allahu Akbar" and excitement by the crowd. As the dean of academic affairs for the United States' largest Muslim academic institution, Memphis-based AlMaghrib Institute, Qadhi's words reach more impressionable minds than most other American clerics. AlMaghrib partners with mosques, student organizations, and larger organizations nationwide to provide a conservative education for young Muslims. With this powerful influence, the preacher sets the standard for America's young Muslims, particularly on controversial issues like gender roles and Muslim/non-Muslim relations. While the Times described Qadhi as "uniquely deft at balancing the edicts of orthodox Islam with the mores of contemporary America" and as someone who only used to "spout a harder line," several of his recent statements show that the charismatic preacher hasn't changed from his hardline Salafi roots. In a video posted to YouTube last November, Qadhi advocated Saudi Arabian-style restrictions on Muslim women in the United States to protect them from Western "wolves and predators." "Well the question arises, would I recommend a job for any [Muslim] sister and the answer is in general, in general no," Qadhi said. "No one has liberated you from the wolves that are men more than Allah and the Sharia [law] of Allah. So if you stick to the Sharia, you will keep your honor and dignity and liberty," he said. "And if you go beyond the Sharia this is where the wolves and the predators will come and try to get you." The average Muslim woman doesn't need to leave the home, Qadhi said. That kind of theology resembles Saudi Arabia, where women cannot drive and require a male guardian's approval to engage in many day-to-day activities. 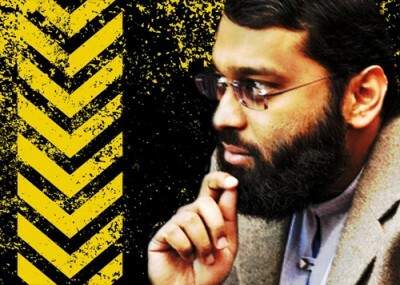 Qadhi received his undergraduate education from the nation's conservative Islamic University of Medinah. To Qadhi, working women destroy families. The rise of "women's liberation" in the 1920s started the undermining of traditional values, which had been strong "even in kaffir [disbeliever] societies," he said. The problem arises when, "women are trying to encroach on men's roles and vice versa. If each one did their job properly then there is no point of competition." His only exceptions to this rule are those jobs that deal with other females, like teachers at girls' schools and gynecologists. These positions are permissible because they stop men and women from interacting. However, even those jobs are permitted only "if her husband allows her; or if she is not married and her father wishes her to, allows her to work; she may work as long the environment is permissible; and she is doing something which she needs to do; and she's not interacting with men." "Allah has told you that this is your best role [as mothers and wives], that this is what you are most capable of doing. He has protected you from the wolves of society, stay at your house, your food and drink will come to you," he said in the YouTube video. "What more do you want?" Professional fields are out of the question. "I don't see the need for women in many other fields," Qadhi said. "There are only a few fields, like for example in engineering, as I said, I don't see the need. We have men, they're doing the job. We don't need women in this field where they're going to interact with men. What's the point?" Qadhi claims that he isn't promoting chauvinism; we're just predisposed to think of such sentiments that way because of the influence of Western culture. It's the weakness and dastardliness of men that is the danger, he says, so women shouldn't feel negative about staying at home and taking subservient roles. Qadhi has also called for Islamic theocracy to replace democracy, and expressed blind hatred against non-Muslims. "Here in these verses [of the Quran], Surat Maida, verses 49-50, Allah categorizes all types of laws into two categories, the law of Allah and the laws from others. And he calls the laws of Allah a fair and just law, and he calls all others Jahiliya, ignorant laws," he said in another speech. "It is not my right to legislate or your right to legislate. No supreme court, no system of government, no democracy where they vote. Can you believe it, a group of people coming together and voting, and the majority vote will then be the law of the land. What gives you the right to prohibit something or allow something?" "To believe that it is permissible to follow a way of life, to follow a system of laws other than the Sharia, negates one's testimony of Islam," he said in another speech. "This type of thinking is clear kufr, clear disbelief, to believe that you know better, or any system of government knows better, any democracy, or any … whether it be communism or socialism, any type of philosophy is better than Islam, or it is allowed legitimately, it is allowed to follow this system, this is a profession of the fact that you believe that Allah is not All-Knowledgeable," he said. These quotes, part of the series "Fundamentals of Faith," were broadcast on the popular British Muslim TV 'Islam Channel' and other English-language Islamic channels. In other speeches, he described an eternal conflict between Muslims and non-Muslims. "And this is the Sunnah [Practice] of Allah that the Kafir [disbeliever] will always hate the Muslim - the Jews and the Christians and the Hindus and every single non-Muslim," he said in an undated sermon. "He might allow every other religious minority or any other religion inside of his society and culture, but when it comes to Islam, because it is the religion of truth, he will find it inside of him to hate it. You cannot just be neutral when it comes to Islam; you are either a Muslim or you are a Kaffir that hates Islam." We've written at length about ICNA's extreme theology, as evidenced by the curriculum it requires its members to follow. In 2009, the group assured Americans that "[e]xtremism has no place in Islam, and ICNA works tirelessly to oppose extremist and violent ideology." Officials forgot about that statement when they invited Qadhi to speak about the demise of capitalism.